The ATR 42 which is made in France and Italy is a twin-turboprop, short-haul airliner. The name "42" derived from the aircraft's normal seating, which varies from 40 - 50. 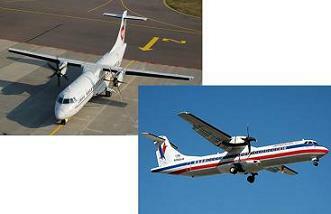 The aircraft was the root for the ATR 72. The ATR 42 was made public in 1981, making its first flight on 16 August 1984. French and Italian certification was issued in September 1985 and its first revenue flight was in December of the similar year with Air Littoral in France. As of January of this year 2009, at least 401 ATR 42s have been made worldwide.